There is a healthy debate about the correct time to change the oil in your boat’s engine. Many people believe that fall is the perfect time. You are taking your boat out of the water at the end of the season so why not do it then. Not only is the oil being changed, but it also affords you the chance to make sure the engine is dry so there is no condensation left behind to cause freeze or corrosion damage. Others believe spring changes are critical to provide the freshest lubricant for an engine when it needs it most, which is during operation. The answer is both recommendations are correct. In addition to changing the oil every 50 to 250 hours (depending on manufacturer recommendation), it’s important to change the oil when winterizing in fall, as well as in spring. The fall change is recommended to prevent impurities from dirty oil damaging the engine. 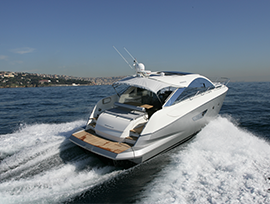 Dirt and water accumulate during use in most marine engines, causing several problems. Water can cause development of caustic, corrosion-causing acids, which result in anything from rust to erosion of components. Dirt and oil breakdown can cause sludge build-up, resulting in rough engine starts. However, that fresh oil sitting in an unused motor all winter can pick up water via condensation and lose viscosity after sitting for months. This is also less than ideal for your boat’s engine life. Particulates may also remain from previous use. In any situation where the engine is not allowed to reach operating temperature for any length of time, such as with sailboat auxiliaries, it is advisable to run the engine and change the oil. By doing this, you guard against condensed water turning into acid in the crankcase and particulate build-up. Starting and running the engine for at least a half hour in the spring will get the oil warmed up and circulating through the engine to help remove any accumulated water or particulates from winter storage. Warming the oil will also help with its removal from all parts of the engine. Many boat owners find the oil change a cumbersome process. Tools like extracting pumps have made oil changes easier, but there is something to be said for letting the experts take care of the “dirty work” for you. PPG techs have decades of experience with marine engine service and welcome your used oil. We’re also here for any other service needs.